A dynamic alert system based on percentage change data gives traders immensely more opportunity to detect and action short/medium and long term volatility spikes in the market. How can you use the Crypto Detective Service? Analysis is the key component within the Crypto Detective tool. 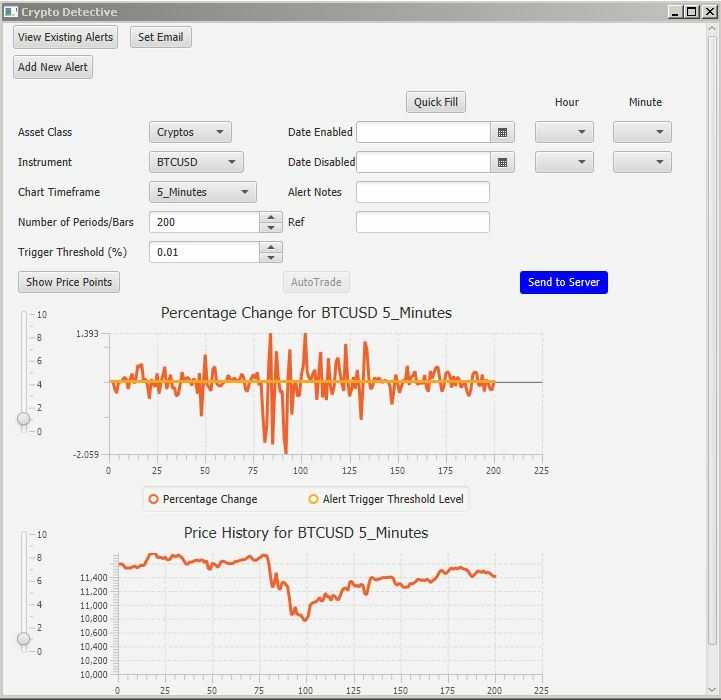 Traders can analyse the percentage change data for their chosen Cryptocurrency on specific timeframes and set a trigger threshold. 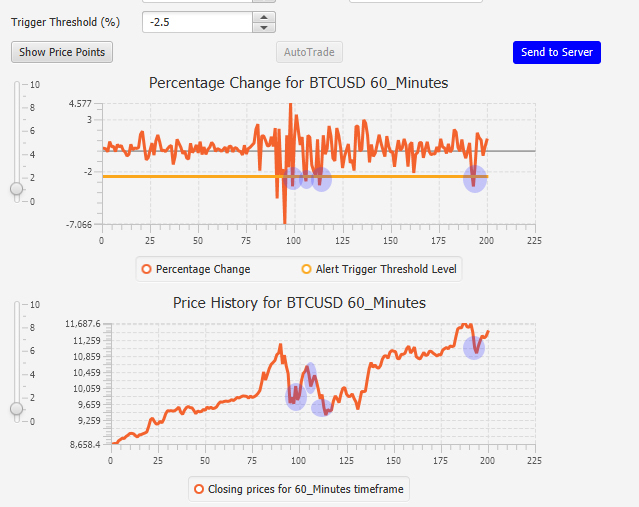 The images below shows the percentage change data for Bitcoin on various timeframes and also the accompanying price action. 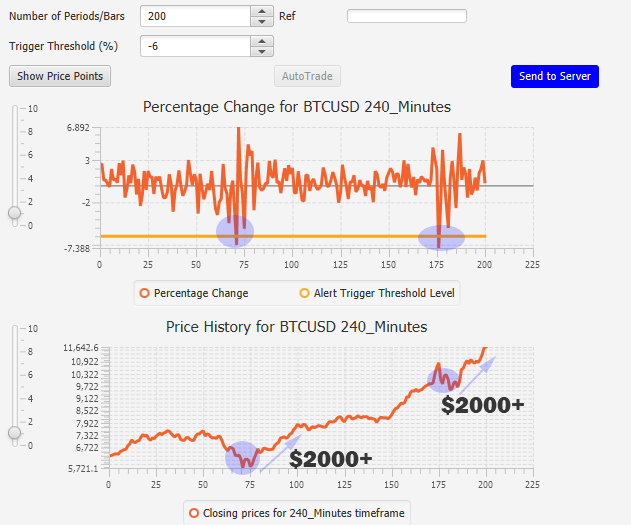 The important aspect regarding price spikes is to understand the drivers behind them. In the Forex market large price spikes are generally created by economic nnews releases. However, the cryprocurrency market has a completely different set of price drivers due to it's decentralised nature. The crypto market appears to be heavily influenced by sentiment and news flow from governments, central banks and high profile individuals in the traditional financial industry. There appears to be a significant amount of FUD (Fear, Uncertainty and Doubt) being injected into the crypto industry by traditional authorities which some may argue is because the 'old guard' are beginning to realise the threat posed by a decentralised digital economy. In other words the crypto currency space introduces disintermediation - the removal of the middle man! Depending on your point of view the Cryptocurrency market is either doomed to fail or is unstoppable. At FX AlgoTrader we think it's the latter... from our point of view Banks and traditional intermediaries are the Blockbuster Video and Bitcoin and cryptos generally are Netflix. In summary, every time a central bank, large banking institution etc inject some FUD into the crypto market it generates an opportunity for long trades... or in common parlance "Buy the Dip". After logging in the trader is presented with the main control interface where they can view existing alerts, add new alerts and also set up the email address which alerts should be sent to. The screenshot above shows the interface options for adding a new alerts. 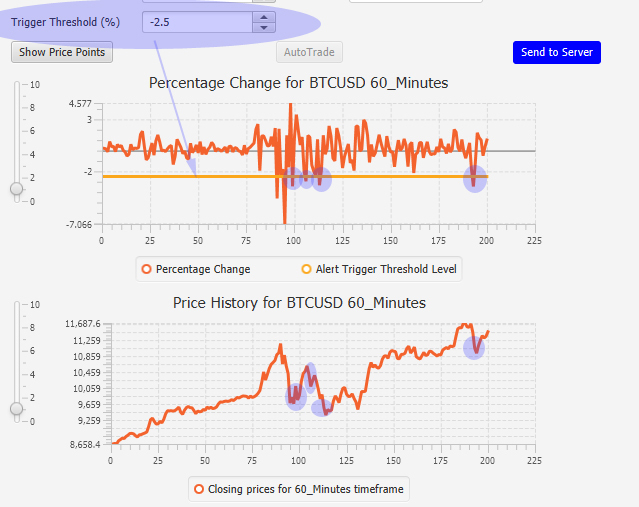 In the example above, as soon as the trader selects the asset and timeframe the system accesses the alert server and generates percentage change data and historical price data. The trader then has the option to control the alert start date and time and of coarse the alert end date and time. There is also a notes field which the trader can use to add custom notes for each individual alert. The alert threshold controls the level where an alert is generated. If the percentage change data exceeds the threshold level the system triggers the alert. The threshold levels are set using the Trigger Threshold (%) spinner control. You can see the trigger level in the percentage change data represented as a horizonal line. Of particular note with BTCUSD is large negative percentage changes on the hourly timeframe most often provide highly profitable long entry points.